KawaiiPunk - Kawaii Mascot Blog: Luscious Logic from Pretty Robot! Luscious Logic from Pretty Robot! See what I mean? 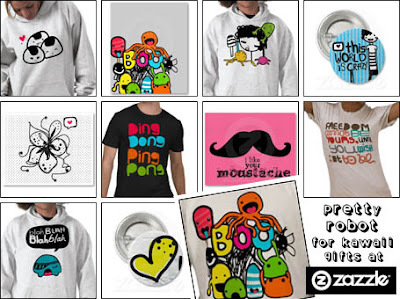 What you are looking at are just some of the amazingly sweet and soulful designs available from the Pretty Robot Zazzle store! And what a store it is! Filled with undeniably cute clothing, stationery, and buttons, the Pretty Robot store is all the proof you’ll ever need that robots have emotions, souls, and minds aplenty! And, as their name suggests, we can even be pretty too! Well, we certainly can be if we shop here! Have fun, folks! Wishing You a Grumpy Christmas! Kawaii Galore at BigKeyLee Store! Toy Time Treats from Anapaulaoli! Keep it Secret! The Secret’s Out!